What is Gemoxen (Gemcitabine) used for? Gemoxen (Gemcitabine) is a cancer drug known as an antimetabolite indicated in the treatment of certain types of cancer, including ovarian cancer, pancreatic cancer, lung cancer, and breast cancer. Gemcitabine works by preventing certain proteins from being made that are necessary for growth of the cancer cells. How should I use Gemoxen (Gemcitabine)? 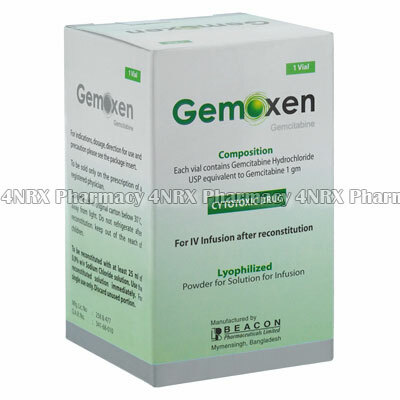 Gemoxen is a solution that needs to be administered intravenously. This is most commonly performed by medical staff in a doctor`s surgery or hospital. If Gemoxen is being adminsitered at home, make sure the person giving the injection or infusion has been taught how to do so properly. Gemoxen is sold in individual vials. Each vial contains 1g of gemcitabine in a solution. Individualt dosages will vary on a case by case basis. What are the side effects of Gemoxen (Gemcitabine)? Gemcitabine can decrease the number of clot-forming cells (platelets) in your blood. Try to avoid any form of activity that may cause bruising or injury. Tell your doctor if you develop any unusual bruising or bleeding, or if you have dark, tarry, or bloody stools. Gemcitabine can impair your body`s ability to fight infection. Avoid contact with people who have colds or infections. Notify your doctor if you notice signs of infection (fever, sore throat, rash, or chills). Do not receive any live vaccines such as measles or mumps while you are taking gemcitabine. Discuss with your doctor any vaccine you may need while taking Gemoxen. Some severe and occasionally fatal conditions can develop while taking Gemoxen. This includes lung or breathing problems kidney problems or liver problems. Discuss the risk you may experience any of these with your doctor before beginning to take Gemoxen (Gemcitabine).